My youngest child is turning 12 in a week. Over the past year or so she’s been asking to redo her room. Her dad bought her a few things, I’ve gotten her a few things, and she’s spent her own money on some stuff. 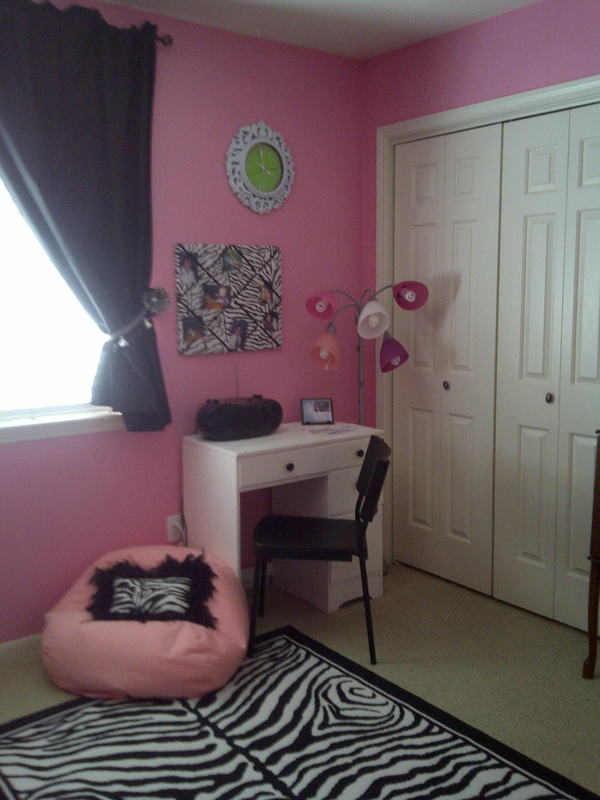 Even though it sounds life she’s been doing a lot of shopping her room still didn’t look redone. She got a new comforter set in a snazzy zebra/pink leopard pattern, but her walls were bright yellow. She found a lime green basket for her flip flops, but her walls were still yellow. The cool lamp with the various shades of pink, the lime green boxes to hold her important stuff, and the feathery zebra throw pillow were all cute, too, but those walls were still yellow. She also had an antique bed and a hand-me-down dresser that looked great with the blue and yellow room she inherited but not so great with the zebra, pink, and lime green room she envisioned. Something needed to be done. A couple of weeks ago she and her brothers went on a trip with their dad. A two week long trip. A trip that meant I had time to do something about those yellow walls. 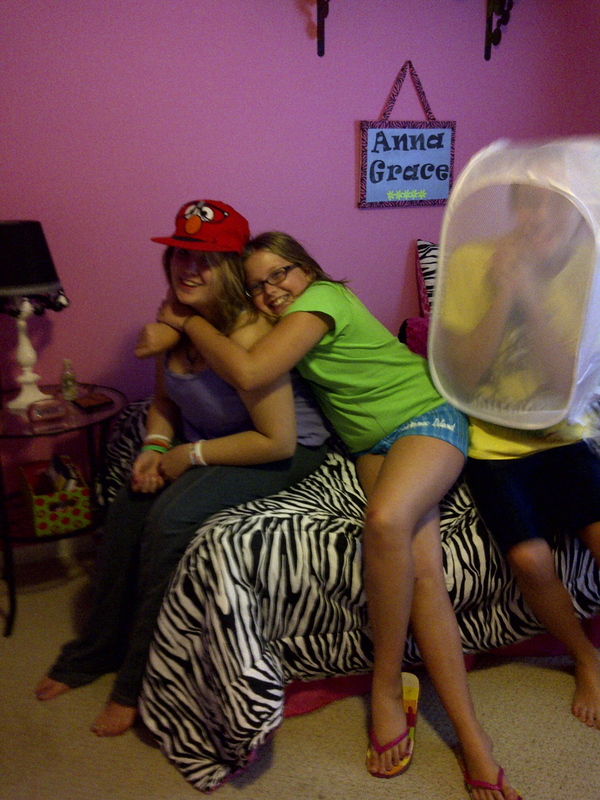 I moved everything I could lift out of her room and recruited help from my dad. We painted those yellow walls bright pink. I stood back and looked at our work, and while it was a huge improvement it still didn’t seem like enough. I decided that the furniture had to go as well. My dad and brother came over and took the offending pieces away. 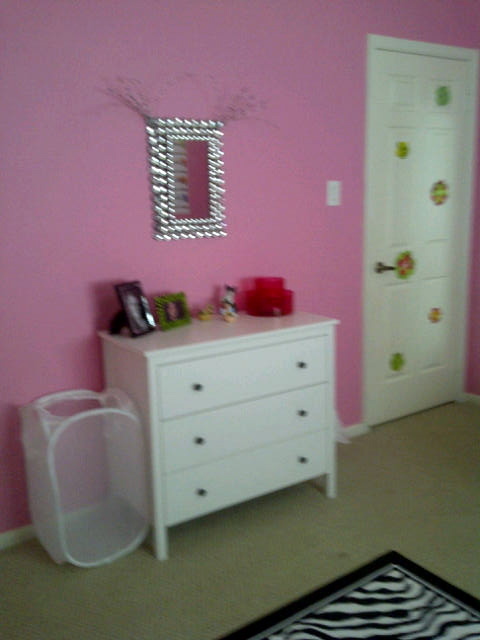 Much better, but OMG it was empty and I am not a decorator type. I know what I like when I see it, but I can’t see a completed room in an empty one. My oldest had stayed in town because of her job so she was now recruited to help. We went to Ikea and bought a new dresser and side table. I got online and purchased a twin mattress and frame. Add curtains, knick knacks, and a whole lot of love and we finally finished yesterday about 2 hours before she was due home from her vacation. When she arrived she knew something was up. In a moment of frustration on their trip she had been told there was a surprise waiting for her if she would get herself together. We played it casual and talked about the trip for a few minutes before she noticed that her bedroom door was closed. She looked over at me and hesitantly asked why her door was closed. I said something about trying to keep the house cool so I closed doors. She made her way to her door and screamed when she opened it. She couldn’t believe how much we did. She said that at one point when she was thinking about her surprise she wondered if I would do her room. She said she figured it would be painted maybe. She had no idea we would go all out. This smile hasn’t left her face since. So worth it! Great remodel and must have been fun to watch the reaction.